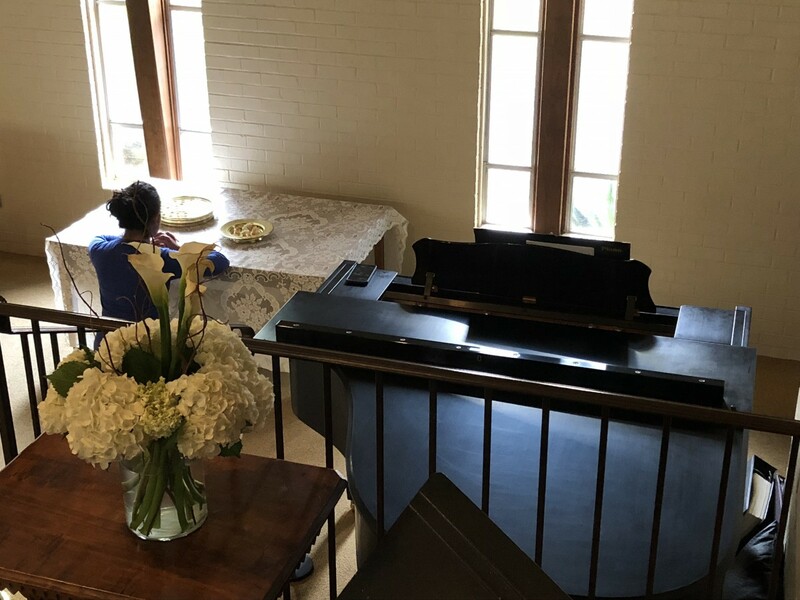 Yet, in a hidden hallway, behind the sanctuary at University Baptist Church (UBC), is a silent communion room. 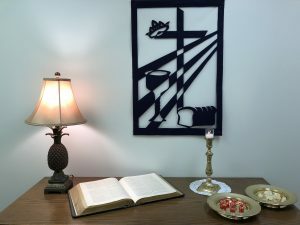 In this small room each Sunday, between 9am and 12pm, one can find –all alone – the communion elements set out for consumption. The room has no windows, but in front of one wall stands a table of votive candles. 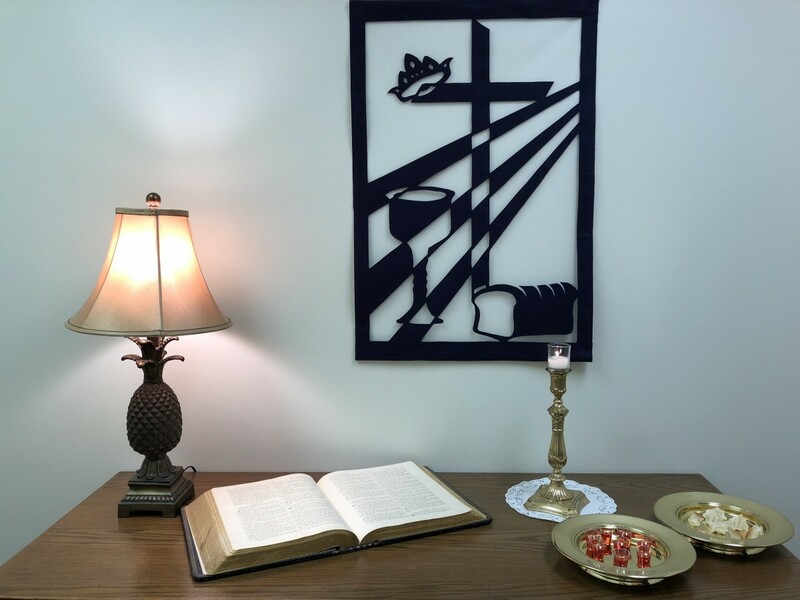 Against another wall rests a table with a Bible, the bread, and small cups of juice. With no other invitation than a listing in the weekly bulletin, communion is “served.” It is quiet. It is private. Consumed by curiosity and concerned about the individualistic implications of this practice, a project idea formed. 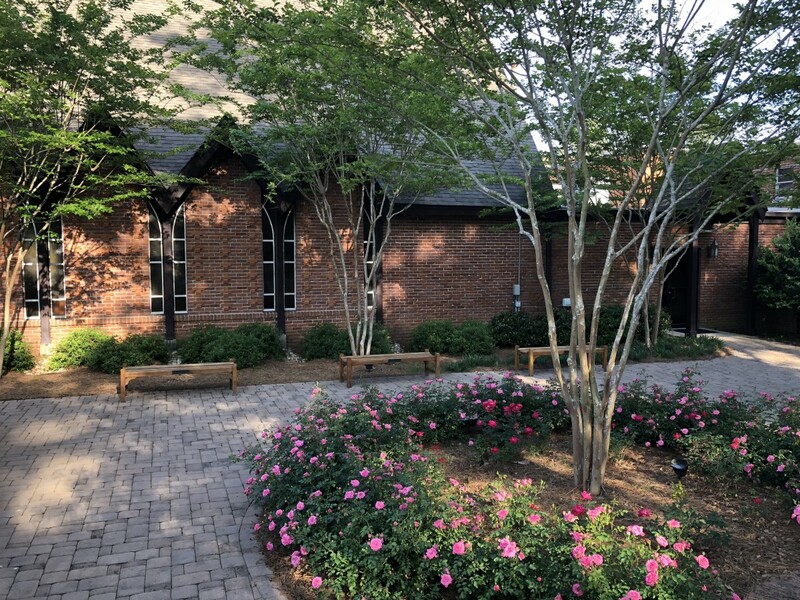 The Supper, has become for many Baptists, however, an act of personal piety.3 For many Baptists, it is simply an outward sign of an already present inward grace.4 The Silent Communion Room at University Baptist Church puts personal faith into personal practice. Silent Communion began at UBC November of 1999. The implementation followed a request for the practice during an August deacon meeting that same year. 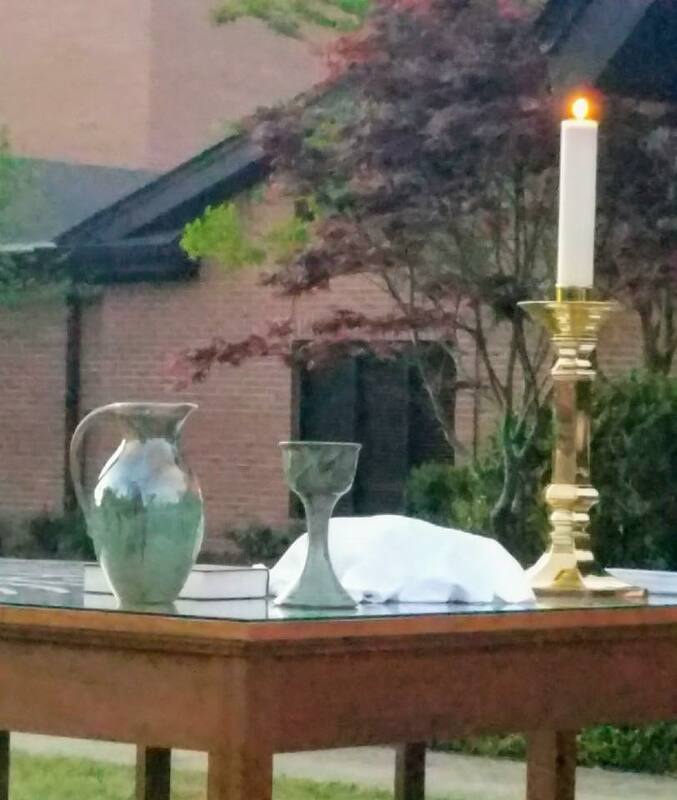 Initially, a deacon was to prepare a table with cloth and elements in the sanctuary each Sunday morning that communion was not served in worship. The assigned deacon would stay in the sanctuary to welcome and administer the elements to those coming for communion. 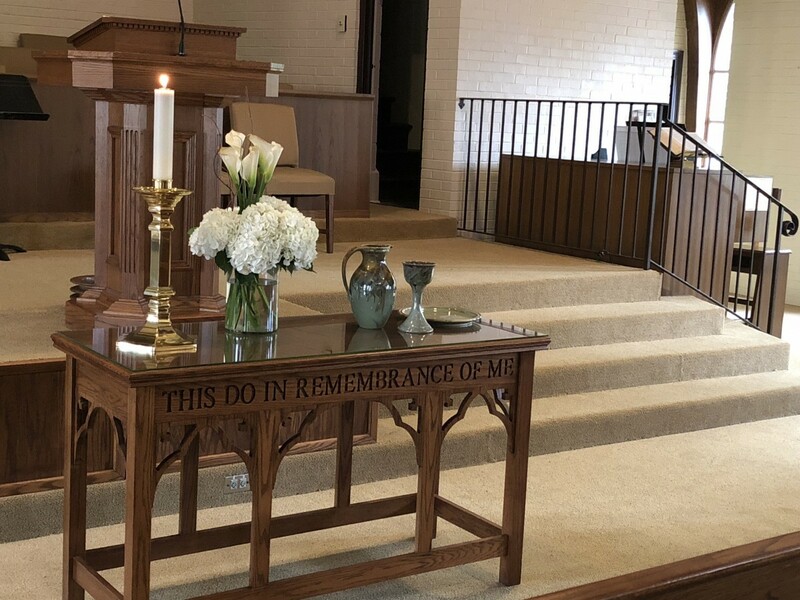 These words were prescribed for the bread were, “The body of our Lord Jesus Christ keep you in everlasting life” and as the cup was offered, “Amen.” There was even a chair designated for the deacon while waiting for members to arrive. The service time was 9:15 – 9:45am. Only a few months later, a proposal was made to move this service to a new room. Along with the move came a renovation proposal. Recessed lighting and dimmers, kneeling benches, and new furniture would set the tone for the new room. Another couple of months passed, and a request was made that deacons not be required to stay and serve. 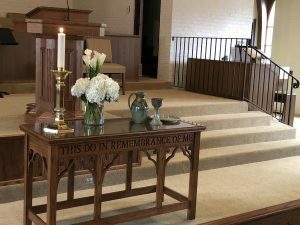 At some point, silent communion was moved from its purposed room to a smaller room located behind the sanctuary and in large part, forgotten. Reading the progression of this practice, one might assume an indifference to the practice, or perhaps a present ignorance of it. One might even assume it could be easily done away with, but such an assumption would fail to take the power of tradition into consideration. Seeking to offer a more robust history of Baptist thought and practice pertaining to the Lord’s Supper, I explored this practice alongside a focus group. 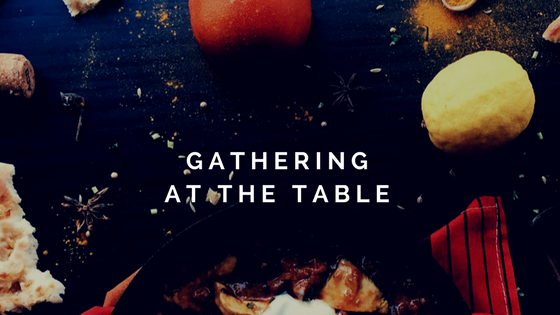 Together, we read scriptural stories of the supper, former Baptist pastors, and Baptist theologians in an effort to gain a richer understanding of the supper and witness its progression in our tradition. Next, the focus group made a list of all the components needed, according to their work, for this practice to be the Lord’s Supper. Following their historical study, the focus group worked together to name those things they think are necessary for practicing the Lord’s Supper. They based these requirements on the study of Baptist history and theology as well as their own reading of the scriptural texts. These are the requirements they posited: each other, remembrance, narrative, elements, reverence, giving and thanksgiving. Then we experienced the Lord’s Supper together via the varied modes of practice used at UBC. In addition to silent communion, UBC has three practices of the Lord’s Supper: intinction, passing of trays, and kneeling tables. Finally, we compared the two. Does our practice match what we say we believe? The experiential part of the project now began, and the group first took by intinction. The story was told, thanksgiving and prayers offered, and elements given. Following the practice, was time to reflect on the experience. The group then looked at the practice and what they had already deemed necessary. The group checked all the boxes for this mode of practice. 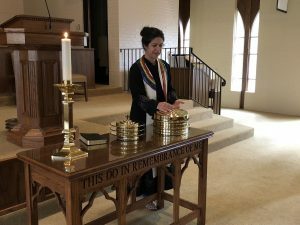 The next week, the group reviewed their stated requirements for the practice of the Lord’s Supper, then group gathe red in the sanctuary pews. All were encouraged to remember along with the celebrant as the story was retold, bread broken, and juice poured. The group then passed trays to one another, ate together, passed trays again, and drank together. Before reviewing their requirements and whether or not this mode of practice checked all the boxes, the group spent some time debriefing. One person commented that in eating the bread, she was more aware of its taste. Another commented that he liked eating and drinking all together – including the celebrant. Another didn’t like that the bread and wine were taken separately. 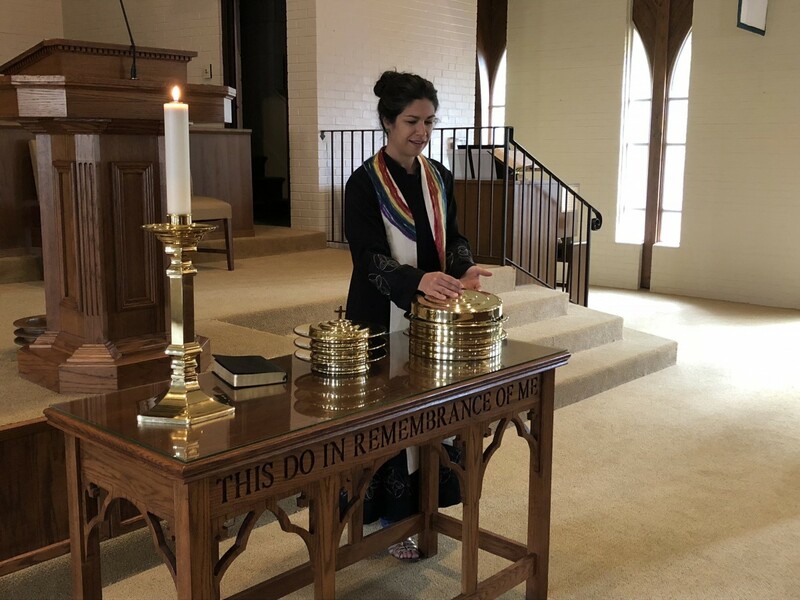 Others commented on their appreciation of hearing the words “this is Christ’s body broken for you” and “the blood of Christ shed for you” as the trays were passed to each person. Others still commented that passing trays was distracting and they worried about dropping them. Following this discussion, the group looked to the board and checked off all their requirements with no problem. Though some might say this practice encourages personal reflection rather than community, this group seems to deeply value the communal elements of the practice. 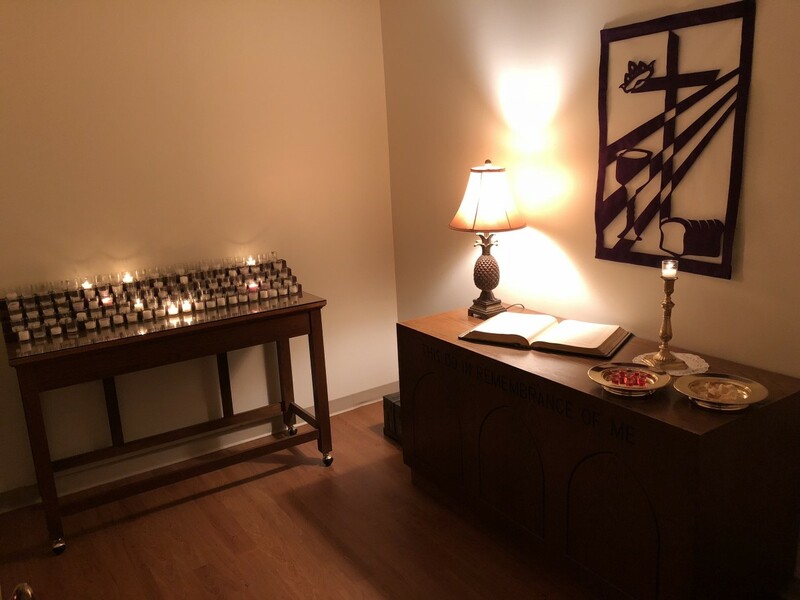 With no formal preparation, the group proceeded to the prayer room for their silent communion practice. There were no instructions for how participants chose to enter the room or spend their time there as there are none on Sunday morning. Several of the group members spoke about the feel of the room. It felt like sacred space to them. They wondered together a bit about how their experience might have changed if they had been in a different place. A couple of members commented that this practice seemed like a different “thing” altogether than what we had done before. It seemed like a different practice than what we had been talking about in these past several weeks. One participant questioned what one might do if she went to the room on a Sunday morning and someone was already partaking. Would she be able to join? Should she wait for that person to finish? Another noted this practice lacked the horizontal element of community; it was a purely vertical communion. Yet, another mentioned that he knelt before the elements, and wasn’t sure that would have been possible for him with others around. All but two of the group members chose to go in alone. These two commented on their need to have another person with them, one saying she wasn’t sure that it would feel the same to do it individually. One member suggested that sometimes people need to see and taste the elements more often than they are offered in the service. This caused another to wonder about when this practice began. At one time, UBC only practiced the Lord’s Supper once a quarter. If someone missed this Sunday, she may only receive the Supper a couple of times a year. Perhaps this room was put in place to fill a need. If this is the case, one has to wonder why the supper wasn’t offered more frequently in worship services. The final practice: kneeling and standing tables. Here, the group begins in the pews as usual, the narrative, words of institution, and prayer are all said, then the group is invited to the tables with bread and juice set out for them. The bread is already torn and the juice in individual cups on the table. People may come in pairs, in groups, or on their own. It is up to each person. Traditionally, families have gone up together during the UBC Christmas Eve service to take of the Supper in this way. There were a couple things that stood out during this particular time together. First, the group that could not (or chose not) to kneel, all took together standing and waited for one another to finish before leaving the table. Second, though multiple groups and pairs went to the kneeling table at different times, one person waited until everyone was finished to go on his own. Upon evaluation, the group resolved that all their stated requirements were met in the kneeling table. There were a couple of discussions, however, to get to this conclusion. One revolved around the requirement for each other. Participants discussed missing hearing their neighbor speak the words of body and blood to them as they passed a tray. There was also mention that not all went to the table with others. This practice could ostracize individuals without family or friends with whom to take. Another consideration was for larger members whose size might prohibit them from going with others to the table. Another concern centered around giving and receiving. Jesus took bread and gave it to his disciples. The group noted that they went up to the table and took for themselves. They decided, however, that the preparation of the plate indicated an offering as well as the celebrants’ actions over the table. While I agree with Kenneson, I want to suggest that a further distinction needs to be made. Namely, the distinction between personal and private. The assumptions of these terms, personal and private, has proven problematic for my project. The convergence of the terms personal and private suggests they are the same, but important distinctions need to be made. In the Lord’s Supper as in believer’s baptism, a personal response is required. It is a faith practice. One must take the elements into her own body. In this way, it is a personal experience. The practices of the supper and baptism, however, are not private, nor are they for me alone. They are practiced within community and promote unity of the church. 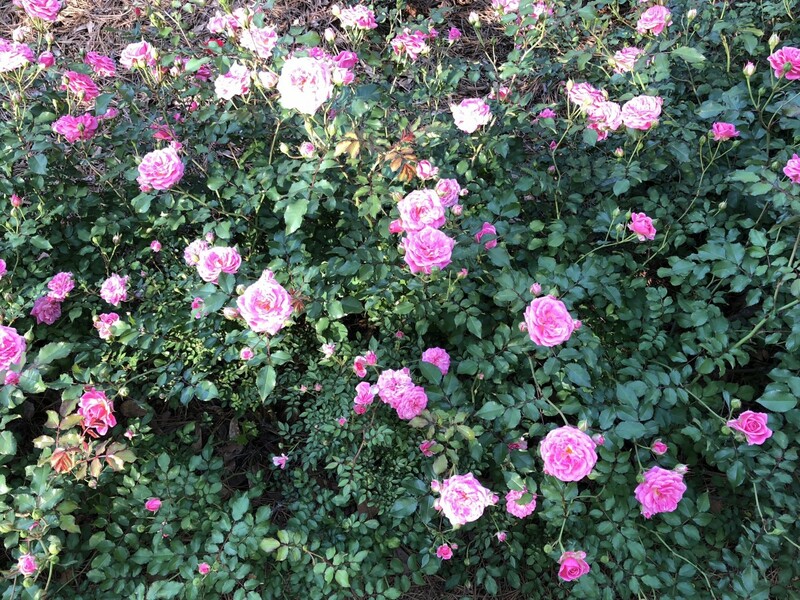 They have a personal significance but surpass the individual. Private is a different matter – especially in the confines of this project. Private, in this instance connotes alone. Taking the elements in a room alone is not only personal; it is private. I interpret some of the deep resistance to let go of the Silent Communion as an argument for the private effect of the sacrament. One participant even argued: we cannot mess with people’s personal beliefs. This comment suggests something beyond personal. It points to a resistance to communal habitus, a privatized faith, set apart from the corrective of the larger body. Freeman points to the problem of individualism in the Baptist church, and Miroslav Volf further emphasizes a need for diverse community in church and sacrament. Even as Volf’s writing is focused on particular homogenous groups rather than individuals, his argument extends and becomes even more valid as we consider communal practices done individually in private. Volf contends, “Unaware that our culture has subverted our faith, we lose a place from which to judge our own culture.”8 Volf shines a light on the danger of private Christianity as it is cut off from those who might help us see beyond our own prejudices to “read afresh the ‘one Word of God.’9 A separate and private practice creates further practices of separation or exclusion. Though the group would not be overly critical of private communion, they were vehement that the table requires a robust welcome. A thread throughout this project was that of an experienced exclusion and a desire for welcome in the sacrament. Participants spoke of growing up in exclusionary practices: members only, believers only Suppers. They argued for a more open table, for a robust invitation to the elements, and for a direct naming of the table – “this is the table of the Lord.” This group was intentional about their desire for welcome and acknowledged they do not have the authority to say who cannot come to the table. Unwittingly, this private communion excludes the other and ignores the communal emphasis of the last supper. It becomes dangerous as it builds on our culture’s already privatized mindset and separates rather than binds. My concern in this instance is less about creating enemies and more about creating an apathy toward the other. How might this independent and private “communion” skew our ability to understand the gospel? Our practices become part of who we are and how we conceive the world without our thinking about them. This is why it is so important the church have intentional habits. These practices form and become a part of us. Smith wonders, “What if we thought of the goal of Christian education and formation, not in terms of the acquisition of a Christian “worldview,” but instead as the acquisition of a Christian habitus?”12 Could it be, that instead, we have allowed the practices of this nation to so form us that we have come to believe autonomy is more important than community? At times during this project, I have found myself frustrated by the lack of desired change. Then, I am reminded that there are many layers to this work. This is not a hypothetical project. It is highly personal. This project is at work in people’s belief systems, long term practices, and the people they love. This is about identity. I am encouraged by the small steps to change that we have been able to make. 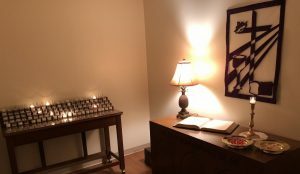 The room will be supplied with a guide that offers prayers and words of institution for the Lord’s Supper. This way, the elements are not simply left for people to figure out what they’re about. I also find it encouraging that the group has noted that this practice does not have to occur alone. More than one person can experience together. Perhaps there will be a way for the church to encourage this later on as well. Finally, the group, even the few who remain adamant that this practice should stay, agree that it cannot be the only Lord’s Supper model at UBC. This mode, in particular, needs another to give it balance. My hope has now been modified from wanting the bulk of change to happen in this eight-week study, to a hope that this work can be built on in the future. 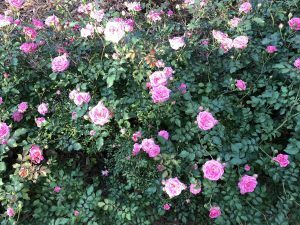 My expectation has shifted from quick changes in practice to slowly changing habits through steady, theologically grounded teaching and ritual. It is my hope this will move us toward healthier long-term practices. 1. Curtis Freeman, Contesting Catholicity: Theology for Other Baptists (Waco, Texas: Baylor University Press, 2014), 245. 2. Paul S. Fiddes, Studies in Baptist History and Thought, vol. 13, Tracks and Traces: Baptist Identity in Church and Theology (Waynesboro, GA: Paternoster Press, 2003), 168. 4. Freeman, Contesting Catholicity, 330. 5. Broadway offers understanding to the emergence of such thought. He proposes, “The corruption of the doctrine of the priesthood of all believers, often renamed as ‘the priesthood of the believer’, has led to its being interpreted to mean there can be no mediation between Christ and the believer. In vulgar terms, it can be stated ‘ain’t nobody gonna tell me what to believe.’ It is the defiant cry of the Bible reader who say, ‘God said it. I believe it. That settles it.’ When those three sentences are rearranged, one gets a more accurate depiction of the reader’s claim as, ‘I believe it. That settles it: God said it.” See Broadway, The Roots of Baptists in Community, 68. 6. Philip Kenneson, Life on the Vine: Cultivating the Fruit of the Spirit in Christian Community (Downers Grove, IL: InterVarsity Press, 1999), 92. 8. Miroslav Volf, Exclusion and Embrace: A Theological Exploration of Identity, Otherness, and Reconciliation (Nashville: Abingdon, 1996), 53. 11. Smith, Imagining the Kingdom, 82. Wow, Kat. This is a mind-blowing concept. Thank you so much for the work and writing. All the best to you.